I probably shouldn't be posting this review so early, but I thought about summer/September, and I figured that I'm going to be busy with graduate school applications and research and might forget and a review is better than no review, regardless of the timing. Also, there will be no spoilers. Lee Westfall has become one of my favorite heroines ever. First of all, I really enjoyed getting to see what her life was like BEFORE the pamphlets about the Gold Rush arrived and the frenzy invaded her town. Quiet, determined, dutiful to her family; hunting, not afraid to get her hands dirty and help her family survive now that her father has been badly hurt. She has a simple life -- albeit with a fantastical twist, occasionally gathering whatever gold she senses -- and she doesn't really imagine anything else for herself despite the yearning for more, wishing that her parents would let her help more, especially with their financial situation... Until everything changes, and it's time to set off on an adventure to reclaim a future that she wants. My absolute favorite aspect of this book was seeing how much freer Lee got to be as "Lee" instead of "Leah," the girl trapped by gender norms, and how this propelled her own character growth. It's not easy being a boy with not much money -- all the work involved, the little time left for rest, the building exhaustion -- but it shows her the sort of life she wants to live, whether as a boy or as a girl, and how she's going to have to fight for that life regardless of social constraints. It puts me in mind of Diana Wynne Jones's talk on heroes, the male/female parts of any character constantly in struggle and ultimately, how the hero is the story. Lee Westfall is this story, and she is an amazing heroine to follow. If you like the mischievous aspect of cross-dressing in stories, I think you'll enjoy it here; and if you're looking for social critique on how boys and girls are treated differently, you'll also find that here. If you're looking for big showdowns, heroes and villains, this might not be the book for you -- but the other books in the series may be. To me, this one seems a little more quiet because this is about the adventure, the perilous journey to California. There is a series villain, but the real antagonist of this story is the land, the weather, the dying resources. This is where Rae Carson's research REALLY comes into play -- and it reminds me of something a friend said about Carson's books. I haven't read all of them, but my friend said that all the books have some sort of outdoors adventure integral to the plot and which really showcases Carson's research. 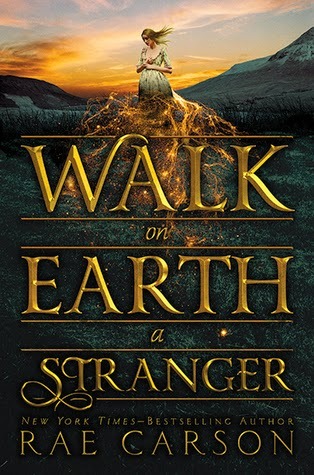 If you've noticed that about her books, well, you'll definitely notice it in Walk on Earth a Stranger. Carson writes with as much historical detail as someone like Diana Gabaldon and with the flair of older fantasy tales, where daily life actions can make up a larger part of the narrative. That gives you a distinct sense of the atmosphere and the struggles of the people at that time period. (Nice shout out to Manifest Destiny, ha!). It brings the world to life, giving you details to imagine as Lee and the others go about their lives. And their lives are difficult; the awful terrain, the dwindling food supplies, the lack of proper medical treatment that we take advantage of today... oof. Bravo to Carson for historical detail and plenty of danger to liven the plot. Plenty of plot twists, and plenty of unpredictable turns. Now, what I said about historical detail? That's also evident in the character's attitudes. And oh, Carson does not make it easy on her characters. There are some real scumbags here, people hating on Native Americans, people believing in slavery, people being cruel to animals, people clearly acting on a gender divide of labor division and virtue. Historical detail, like I said; but Carson also allows some of her characters time to grow. It really showcases her talent as a writer to be able to develop these characters alongside her heroine and see some of their attitudes change along with the terrain. The fantastical elements are not as much in play as I thought they would be, but what is here hints at some truly interesting times for the rest of the series. Lee seems to lose a bit of herself when her power is activated and that mad frenzy to find the gold takes over; and I'm curious to see how that greed will come into play in future books now that she has made it to California. 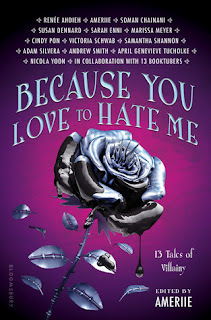 The romance is also definitely slow-burning, Lee and her romantic interest given time to allow their friendship to evolve before they take on a romantic edge. Also, it's definitely a side plot, since the foremost focus is actually GETTING to California ALIVE. As with the fantastical elements, there is a lot of potential to come. This is a wonderful first book that does well to highlight the series, and is filled with high stakes adventure, a determined, spirited, easy-to-root-for heroine, slow-burning romance, and a large, wonderfully developed side character cast. Definitely coming back for more.